Doug Blevins was only four years old on New Year’s Eve, 1967, when the Green Bay Packers beat the Dallas Cowboys in the final seconds of the National Football League championship game. That legendary game has come to be known as the Ice Bowl because it was played in a temperature of 17 degrees below zero. 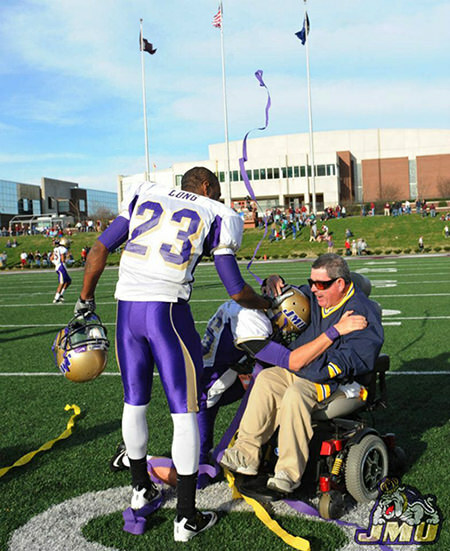 Watching that game from his warm home in Abingdon, Virginia, changed Blevins life. “From that moment forward, I knew that I wanted to make my living working in professional football in some capacity,” he says. 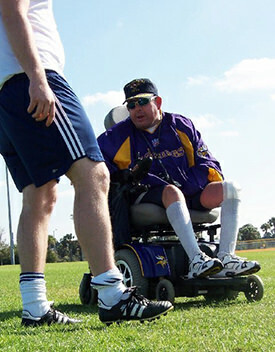 But he couldn’t play football and he never would because he was born with cerebral palsy. He never walked in his young life. Blevins developed a specialty coaching kickers. He became a kicking guru with a reputation so stellar that aspiring kickers have sought his tutelage for over a decade. Blevins experienced his most satisfying moment as a coach when he watched one of his prize students, Adam Vinatieri, win Super Bowl XXXVI in 2002 for the New England Patriots when he kicked a 48-yard field goal as time expired. The kickers competing in this year’s Super Bowl, David Akers of the San Francisco 49ers and Justin Tucker of the Baltimore Ravens, were both coached by Blevins. Kickers and punters flock to Abingdon from far and wide to learn from him. 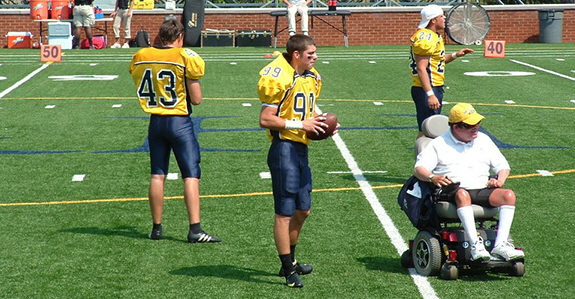 These days he lives with his 14-year-old son and coaches kickers at Emory & Henry College in Abingdon. Blevins intends to heavily pursue a coaching position as soon as his son graduates from high school. His ultimate goal is to be a college or professional head coach.